Under the heading “Tax Reform 2.0,” the House Ways and Means Committee has introduced new proposed legislation that follows the federal tax plan that was passed into law by President Trump late last year. The proposed Tax Cut 2.0 would permanently preserve a number of provisions that went into effect in 2018 and are currently scheduled to “sunset” after 2025. The House is expected to begin the voting process as early as next week (September 24). The Congressional Joint Committee on Taxation estimates the bill “Protecting Family and Small Business Tax Cuts Act of 2018,” would reduce federal revenue by $631 billion in the next decade (2019-2028) and an additional $3.15 trillion between 2029-2038. Furthermore, this proposed second round of GOP tax cuts would add $3.8 trillion to the federal deficit over the next two decades, according to a report released by the Urban-Brookings Tax Policy Center. In other words, the proposed federal tax cut 2.0 would mean a further cost shift to the states and paves the way for even more significant reductions in the federal programs and services that ensure the economy is functioning efficiently and effectively, and that more people are connected to opportunities. The last time Congress rushed a federal tax plan was last year when in 2 months it rushed a tax law at a cost of $1.9 trillion over the next ten years. As a result our country’s tax code has now been changed in a way that benefits wealthy taxpayers and foreign investors while asking more from low and middle-income taxpayers. 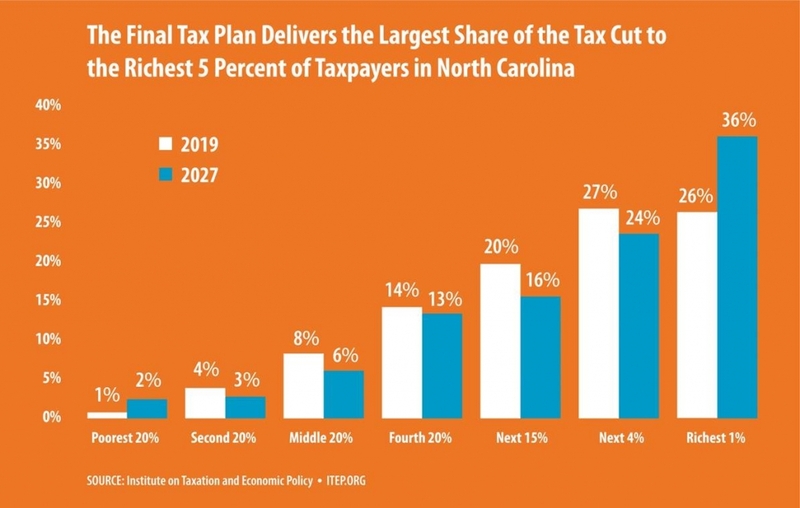 In North Carolina the richest top 5 percent received half of the total tax cut benefits. Meanwhile, the poorest 20 percent only received 1 percent of the benefits.